Download "INTERNATIONALLY RECOGNISED CORE LABOUR STANDARDS IN BRUNEI DARUSSALAM"
1 INTERNATIONAL TRADE UNION CONFEDERATION (ITUC) INTERNATIONALLY RECOGNISED CORE LABOUR STANDARDS IN BRUNEI DARUSSALAM REPORT FOR THE WTO GENERAL COUNCIL REVIEW OF THE TRADE POLICIES OF BRUNEI DARUSSALAM (Geneva, 27 and 29 February 2008) EXECUTIVE SUMMARY Brunei Darussalam became an ILO member at the end of 2007 and has ratified none of the eight ILO core labour standards. 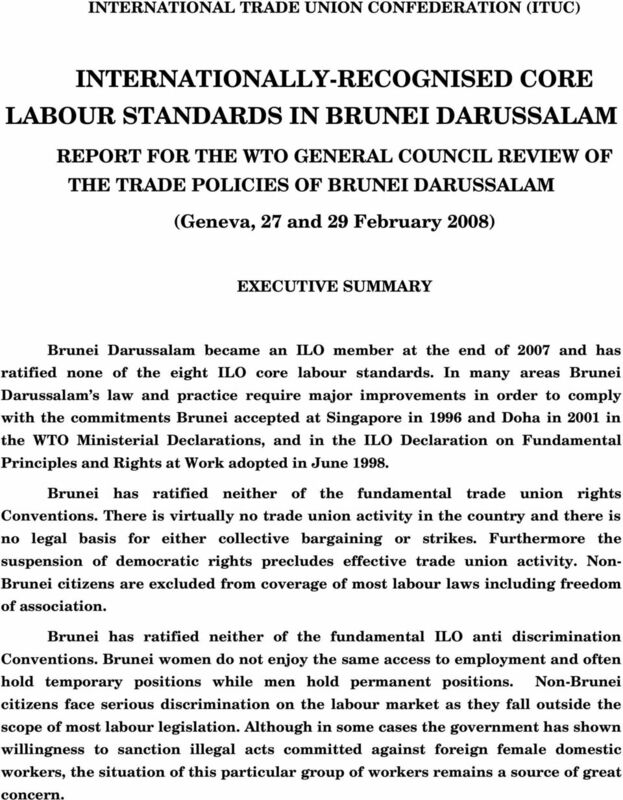 In many areas Brunei Darussalam s law and practice require major improvements in order to comply with the commitments Brunei accepted at Singapore in 1996 and Doha in 2001 in the WTO Ministerial Declarations, and in the ILO Declaration on Fundamental Principles and Rights at Work adopted in June Brunei has ratified neither of the fundamental trade union rights Conventions. There is virtually no trade union activity in the country and there is no legal basis for either collective bargaining or strikes. Furthermore the suspension of democratic rights precludes effective trade union activity. Non Brunei citizens are excluded from coverage of most labour laws including freedom of association. Brunei has ratified neither of the fundamental ILO anti discrimination Conventions. Brunei women do not enjoy the same access to employment and often hold temporary positions while men hold permanent positions. Non Brunei citizens face serious discrimination on the labour market as they fall outside the scope of most labour legislation. Although in some cases the government has shown willingness to sanction illegal acts committed against foreign female domestic workers, the situation of this particular group of workers remains a source of great concern. 2 2 Brunei has ratified neither of the fundamental ILO child labour Conventions. There is no significant report on Brunei children having to perform work. No data are available on the situation of non citizens children. Brunei has ratified neither of the fundamental ILO forced labour Conventions. Although the law prohibits forced and compulsory labour, the living and working conditions of some foreign workers may be assimilated to forced labour. Trafficking in persons for the purpose of work occasionally occurs. 4 4 attract foreign direct investment (FDI) and promote joint ventures. BEDB has a two pronged strategy, firstly to develop a number of industry clusters, including tourism, transportation and logistics, and financial services. The second strategy has two parts. The first is to develop oil and gas related downstream activities at Sungai Liang proposals include urea and ammonia plants, an aluminium smelter, and a tyre recycling facility. The second is to develop a port and industrial complex at Pulau Muara Besar. Japan accounts for around 40% of Brunei s exports and ASEAN for approximately 20%; Australia, Korea, China and the US are also important destinations. The Brunei market is highly import dependent with few tariffs or other trade barriers. Brunei imports almost half of its goods from ASEAN neighbours, with the US, Japan and the EU accounting for around 10% each. Brunei is a member of the Association of Southeast Asian Nations (ASEAN), ASEAN Regional Forum (ARF), Asia Europe Meeting (ASEM) and the Asia Pacific Economic Cooperation (APEC) forum. I. Freedom of Association and the Right to Collective Bargaining Brunei Darussalam has not ratified ILO Convention No. 87 (1948), the Freedom of Association and Protection of the Right to Organise Convention, nor ILO Convention No. 98 (1949), the Right to Organise and Collective Bargaining Convention. The Trade Union Act of 1961 authorises the creation of trade unions, which must be registered with the government. The law prohibits employers from any sort of discrimination against workers connected to trade union activities, and unions are permitted to form federations. However, the law prohibits unions and federations from affiliating with international trade union bodies unless they receive prior written consent from both the Minister of Home Affairs and the Labour Department. There are only three trade unions registered in the country, all in the oil sector, representing a total of approximately 1,500 workers. Two of the unions representing office workers are allegedly inactive, while the remaining union, comprised of manual oil field workers, has limited activities. These unions exercise little independence from government authority. Civil servants are permitted in theory to form and join unions, except for those in the army, police, and prisons, but none have done so. There is no provision in law that underpins the right to collective bargaining. An individual contract is required between an employer and each employee, and legal trade union activities are not allowed to violate these individual employee contracts. 5 5 The law does not explicitly recognise any right to strike. The majority of labour laws only apply to citizens of Brunei, thereby failing to cover skilled and unskilled migrant workers, who comprise between 30 to 40 per cent of the total workforce. There is one export processing zone, the Muara Export Zone, where labour laws apply in full. 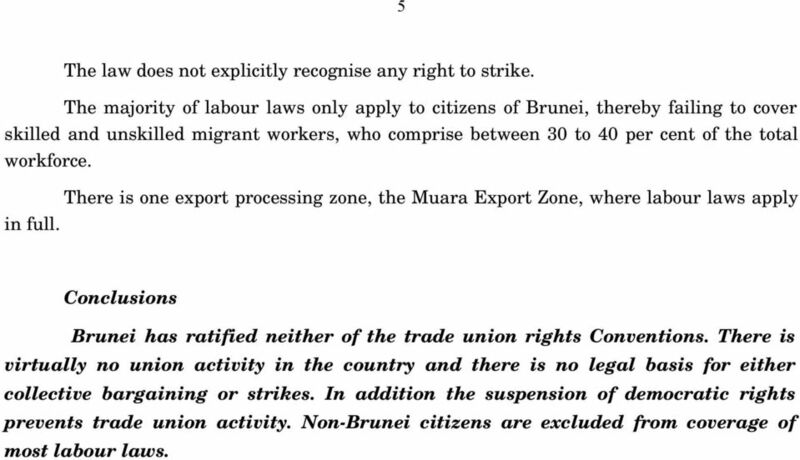 Conclusions Brunei has ratified neither of the trade union rights Conventions. There is virtually no union activity in the country and there is no legal basis for either collective bargaining or strikes. In addition the suspension of democratic rights prevents trade union activity. 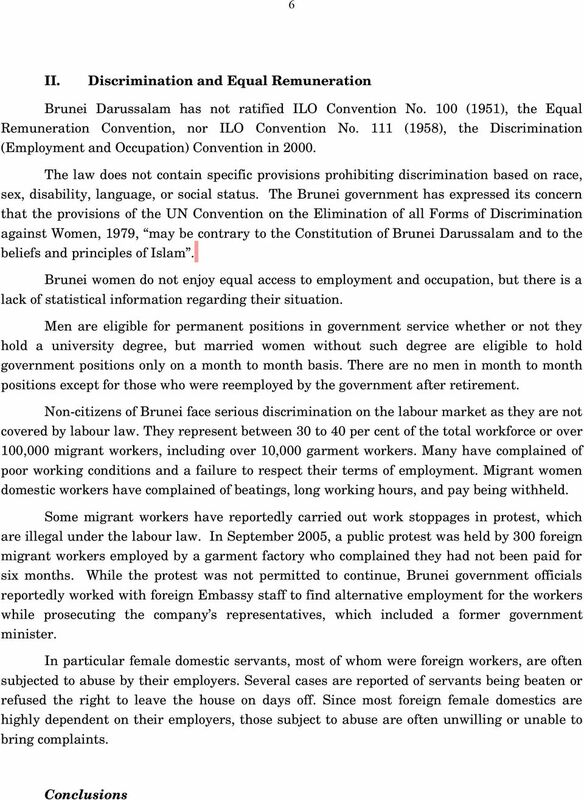 Non Brunei citizens are excluded from coverage of most labour laws. 7 7 Brunei has ratified neither of the ILO anti discrimination Conventions. Brunei women do no enjoy the same access to employment and often hold temporary positions while men hold permanent positions. Non Brunei citizens face serious discrimination on the labour market as they fall outside the scope of most labour legislation. Although in some cases the government has shown willingness to sanction illegal acts committed against foreign female domestic workers, the situation of this particular group of workers remains a source of great concern. 8 8 III. Child Labour Brunei Darussalam has not ratified ILO Convention No. 138 (1973), the Minimum Age Convention, nor Convention No. 182 (1999), the Worst Forms of Child Labour Convention in For Brunei children education is free, compulsory, and universal for the first 12 years, after which it is still free but no longer compulsory. Various laws prohibit the employment of children under age 16. Parental consent and approval by the Labour Commission is required for those under 18. Female workers under 18 may not work at night or on offshore oil platforms. The Department of Labour, which is part of the Ministry of Home Affairs, enforces the employment law for Brunei children. There is no report available on the situation of non citizen children. Conclusions Brunei has ratified neither of the fundamental ILO child labour Conventions. There is no report of Brunei children having to perform work. No data are available on the situation of non citizen children. IV. Forced Labour Brunei Darussalam has not ratified Convention 29 (Forced labour Convention, 1930) nor Convention 105 (Abolition of forced labour Convention, 1957). The law prohibits forced or compulsory labour. However, there are reports that some foreign domestic workers work under unacceptable conditions that may amount to forced labour. Foreign workers are recruited mainly from Indonesia, the Philippines, Pakistan, India, and Bangladesh and occasionally face harsh, exploitative conditions. Some workers, most notably in the garment industry, sign contracts with employment agents or other sponsors in their home countries that reduce their promised salaries through payments to the agencies or sponsors. Under the Trafficking and Smuggling Persons Order, a person convicted of trafficking persons, harbouring smuggled persons, or endangering the lives or safety of trafficked or smuggled persons can be fined up to US 600,000 imprisoned for up to 30 years, and caned. Although there are very few denounced cases of trafficking, it does occur most particularly in the context labour. 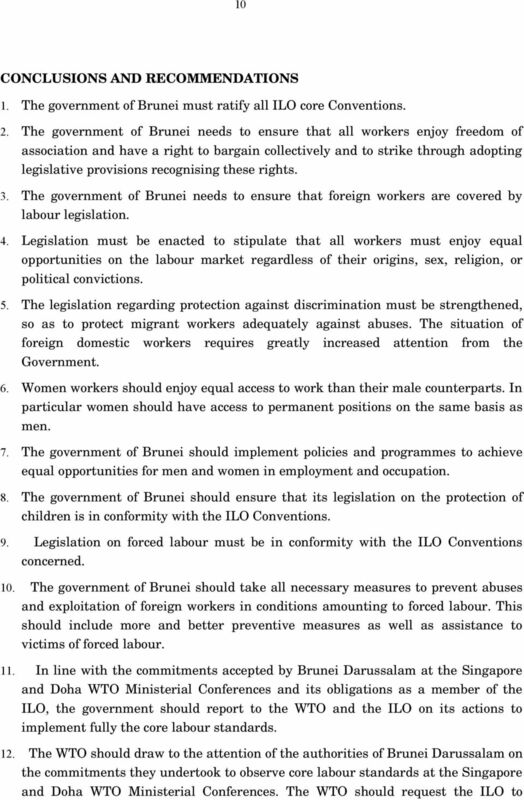 9 9 Conclusions Brunei has ratified neither of the fundamental ILO forced labour Conventions. Although the law prohibits forced and compulsory labour, the living and working conditions of some foreign workers may be assimilated to forced labour. Trafficking in persons for the purpose of work occasionally occurs. TPPA LABOUR CHAPTER FREQUENT ASK QUESTIONS (FAQ) Q1. Why are labour obligations included in Free Trade Agreements? ASEAN CUSTOMS TRAINING AND DEVELOPMENT BLUEPRINT HUMAN RESOURCE MANAGEMENT BLUEPRINT INTEGRITY AND ETHICS BLUEPRINT The Association of Southeast Asian Nations (ASEAN) was established on 8 August 1967. Trade Union Pluralism Through Free Trade?